Game Night, 14 October 2008: Rorschach and the Schadenfreude Pie | Kris Johnson's Blog…sort of. The recipe for Schadenfreude Pie, however, comes from neither a German nor a Saget, ((…nor a Coulier.)) but from a science fiction author: John Scalzi. It was in Mr. Scalzi’s recent retrospective of his ten-year-old blog, Whatever, that the recipe came to my attention. I’ll leave it to Mr. Scalzi to explain how and why the seemingly disparate notions of Schadenfreude and pie—the latter of which has, apart from an incident involving blackbirds and the de-probosciseration of an unfortunate young woman, never been associated with misery in any form—came together in his recipe. Regardless of its storied origin, I was intrigued by the ingredients of Schadenfreude pie, and so decided to attempt to bake one for my gaming friends. The pies were still in the oven when Rachel and the two Davids arrived for the evening’s activities, but were soon removed to the cooling racks while we played Rorschach, a party game in which players examine a series of inkblots and answer such questions as “Which is the cuddliest?” and “Which would keep you up at night?”. Points are scored by selecting the same inkblots as your opponents (thereby, one presumes, successfully delving into the murky depths of their psyches) or by selecting an inkblot that was chosen by none of your opponents (thereby establishing yourself as the freaky, unbalanced misfit). After several rounds of the game, it was agreed that the outcome seemed to be a tie more often than not, though we were not able to agree upon whether this indicated a sloppy game mechanic or a series of disturbing psychological trends amongst our gaming peers. Rorschach was followed by The Great Dalmuti, a card game I’ve owned for probably 10 years or more but had never played, ((I also own—and have played, though only once—Dilbert’s Corporate Shuffle, which is essentially a repackaging of The Great Dalmuti aimed at appealing to the corporate cubicle drone crowd.)) and the arrival of Gus. The idea behind The Great Dalmuti is pretty straightforward: ((Don’t ask me what the idea behind Gus is; I’m as mystified as you.)) you’re better than all these schmucks. The goal is to rid yourself of all the cards in your hand and be declared the “Greater Dalmuti” for the next hand. Unlike most card games, which end after a winner is declared, play in The Great Dalmuti continues until the ultimate loser is determined. The second player to play all of his or her cards is the “Lesser Dalmuti”, while the last two players are the “Lesser Peon” and “Greater Peon” (and forced to pay taxes to their respective Dalmutis at the beginning of the next hand). The game proved to be a lot of fun, but I think next time we’ll set forth some rules as to what, beside taxes, the Dalmutis can expect from the Peons. We really didn’t play up the whole caste system aspect, but I’ve heard of groups wherein the Greater Dalmuti may command the Greater Peon to fetch drinks and such, which sounds like it could add another level of fun. Sometime during The Great Dalmuti the pie was served. Unfortunately, it soon became very evident that I had managed to burn the graham cracker crust. 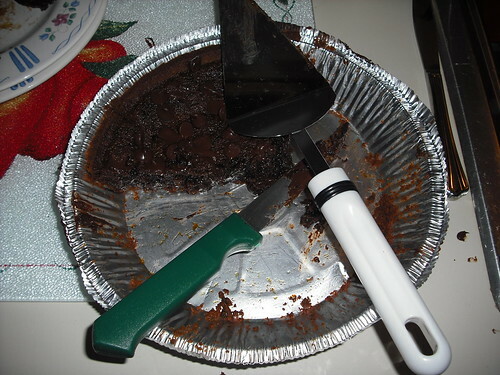 The pie was rather troublesome to cut (a jackhammer would have worked well) but got generally favorable reviews. It is incredibly rich, as one might expect considering that the primary ingredients are dark corn syrup, molasses and dark brown sugar, but not too terribly overpowering provided it is eaten in moderation. ((The second pie, which I didn’t eat until the following day, turned out better than the first.)) Mr. Scalzi’s suggestion that the pie be eaten with a large glass of cold milk was spot on. To finish out the evening (and to keep from slipping into a diabetic coma), we played Carcassonne, a tile game that Laura and I enjoy but had never played with more than three people. As it turns out, six people is a good number. The game was very close: only a single point separated the victor from his nearest opponent, and the overall point spread was somewhere in the neighborhood of fifteen points. I was pretty pleased with how the evening went. We introduced a new gamer to the group, crammed a lot of play into about three hours and enjoyed some dark, sweet pie without having to feel karmically guilty afterward. Previous PostCon on the Cob 2008: Day 3 – TombNext PostHire These Guys, Willya? Woo! I got my own footnote. ‘Bout time! On a side note, the pie was served before my arrival. I didn’t have a piece until after the games were played, as Laura kindly warned me off of it when I first arrived. I decided to try a piece anyway. Laura… I probably should have listened. @Jahnoth — Yeah, every once in a while I finish something I started. @Jahnoth — I may have inadvertently taken some artistic liberties with the timing of things. It would be a big help to me if you’d just remember things the way I say they happen and not concern yourself with the actual order of events. … I still say it would have been pretty good in a different (non graham) crust. @Rachel — I’ve gotten a couple of suggestions for how to make the pie next time, including using a glass pie plate (won’t conduct the heat as well; crust won’t be as likely to burn) and cooking the filling part of the way on the stove before baking it in the oven.